The rest of each chapter provides scientific answers. In the process of providing the background and history the narrator goes off at tangents, but always returns to the original question. In the process Dawkins describes whole areas of science in a lively, interesting and thorough way. The audio version is successful – not easy for science which can often be complex and need visual material. I think this demonstrates that Dawkins’ approach, examples and language communicates the subject well. He certainly does shine as a science communicator. Although I did well without them, I imagine the books graphics will also be very helpful – especially for the younger reader. What I have seen on the internet does look impressive. The publishers have recognised both the importance and consumer response to this book by publishing it in several different formats. A hardcover (or pBook) version, an audio version and an iPad version. Its large graphical content has probably precluded an eBook version – but seems to have made it ideal as an iPad app (see video below). This is reality, after all. As good as this book is there will be valid criticisms to make. Other reviewers might find errors of fact (inevitable in such a book). My main criticism is that Dawkins did not take on the challenge of providing more coverage of modern relativity and quantum theories. On the one hand, I can appreciate the dilemma for the author. To what extent should a book for young people attempt the challenge of such counter-intuitive concepts? And Dawkins does a good job communicating the humility of science and individual scientists. He acknowledges his own limitations by explaining that as a biologist he cannot adequately describe ideas of what caused the “big bang” or what quarks are. His implication is that such questions be directed at particle physicists and cosmologists. This modesty does a lot for his credible image in the book. On the other had – this book is about the magic of reality. It does, in places, show how reality is non-intuitive and that “common sense” ideas often fail. I feel this approach could have included introductory ideas of relativity and quantum mechanics. It would also help to reinforce his message that some of the models scientists use are mathematical and not mechanical. Without getting into the mathematics or the complexity of the logic he could have communicated the idea that we should not expect to build mechanical models of things like the very large, very small or very fast, which are outside human experience. And yet we can construct mathematical models which are very accurate and powerful. It’s a message he has given elsewhere. And it would have added to his excellent description of scientific method and understanding of what we mean by scientific knowledge. The publishers are putting some effort into the book promotion. The book launch itself will be to a large audience at the Royal Albert Hall in London on 19th October (see An evening with Richard Dawkins). No doubt there will be a number of book tours – and there seems a good chance that we will have opportunities to attend one of Richards talks down under. Dawkins will speak at the Global Atheist Convention in Melbourne next April . His publishers took advantage of a similar engagement last year to send him on a speaking tour of New Zealand and Australia promoting his last book (The Greatest Show on Earth: The Evidence for Evolution ). The controversy generated by Dawkins’ book The God Delusion seems to have created a publishing phenomenon. Publishers now unhesitatingly bring us similar books – they see them as best sellers. 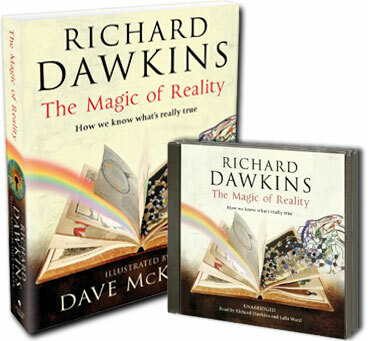 They have also reprinted and promoted Dawkins previous books. Many new readers now have the opportunity to purchase and read other books by Richard Dawkins. I personally feel this has also helped encourage recent publication of many other popular science books. Although controversy over The God Delusion originated from religious sensitivities even his last book (The Greatest Show on Earth: The Evidence for Evolution ) was frantically attacked by creationists. These attacks have only increased sales. I guess its only natural to be somewhat cynical of such promoted publicity. However, it is very gratifying that in this case it’s for such a worthwhile cause. I think most readers will appreciate inclusion of the mythological explanations. They do illustrate the human inventiveness when it comes to primitive explanation, as well as our colourful story telling. Inclusion of multiple mythological explanations in each case also helps demonstrate the ineffectiveness of such mythology – with such variety how can any one tradition seem more reliable than the others. In a sense this, and not the science, is the real seditious message of Dawkins’ book. It is similar to his advocacy for the teaching of comparative religion in schools, rather than providing religious instruction. I expect it will be this, rather than the science, which will motivate the ideological critics of Dawkins to angrily denounce this book, as they have his earlier books. Their emotional reactions will also be motivated by the success of Dawkins as a science communicator and the publishing phenomenon he has become. And who would have it any other way? Not me – I think this emotional reaction is one of the reasons for Dawkins’ success. And given the nature of his message that is all for the good. This entry was posted in book review, creationism, Darwin, Dawkins, evolution, intelligent design, philosophy, religion, SciBlogs, science, Science and Society and tagged App Store, book review, Dave McKean, iPad, Publishing, Richard Dawkins, SciBlogs. Bookmark the permalink. Thanks for your review. I’ll definitely buy this. We know for sure everything in this world will perish. So what is the realty? Real things should be permanent and perpetual. So we can understand that this world is not the real world. So find out which is the real world. That is the meaning of our life. Where do we get these guys from? Do we sweep them up from shopping malls? Poor lost souls with nothing better to do with their time? Did he forget to add in the bit about Viagra or Rolex watches?